Thanks to Amtrak, Paul and I are on the Caveman Diet. This is what happens when a marital bet goes terribly, terribly wrong. It all started last week, on a train ride to Portland. Until recently, cars, trains and airplanes were among the last havens of forced non-connectivity to Our Electronic Overlords. To lure more folks to ride the rails, Amtrak is “Now featuring Wi-Fi! !” on the Cascades route. 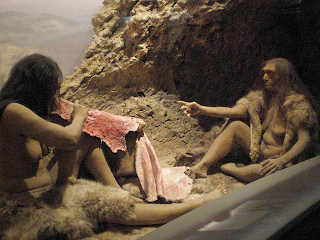 Thus connected, Paul somehow stumbled upon an article on “Urban Cavemen,” people who strive to eat like early, pre-agricultural humans -- no wheat, no dairy, no ... [whatever the hell’s in Fruity Pebbles]. “I’m SO doing this,” Paul declares, brandishing the article on his tablet. If you’re not familiar with the so-called Caveman Diet, the idea is that you only eat foods that would’ve been available to our ancestors during the Paleolithic era, affectionately dubbed “the Paleo” by a growing legion of followers. For instance, dairy is strictly verboten (early man couldn’t be bothered with animal husbandry). Ditto for potatoes, corn, wheat and all other grains. Eggs make the cut, since early humans would gather eggs from birds’ nests, and, presumably, eat them raw (yum!). Thus, neo-Cavemen are free to forage for chicken eggs down at their local Whole Foods. Similarly, you can eat all the nuts you want (after all, you are what you eat...). The hard science behind this idea is hotly debated among nutritionists, anthropologists, and couples on stalled Amtrak trains. Advocates of the Caveman Diet are, to say the least, passionate about "the lifestyle" (saber-tooth tiger bathrobes are optional). Imagine the combined zeal of a Scientologist, a Mary Kay Cosmetics Representative, and the Sham-Wow! guy, and you begin to approach the level of enthusiasm of your average "urban caveman." Yes, this diet will totally be your BFF. It will lend you money. It will help you move. It will cry and watch Sandra Bullock movies with you when your partner dumps you because of the rotting bison carcass in your living room. I’m no Paleontologist, but I have been to The Museum of Natural History on several occasions. I’ve seen the dioramas. Those Early Humans didn’t look happy. Their clothing was very unattractive. They had to spend all their time hunting and gathering, which prevented them from spending their days in higher pursuits, such as looking at videos of rapping gerbils on YouTube. I, for one, don’t want to go back. I’m a big fan of Agriculture. I would totally friend it on Facebook. Thanks to agriculture, we enjoy stables such as tobacco, popcorn, and Slurpees. Other perks include bread, and cheese, and not having to eat the liver and kidney of a Wildabeast. Ever. Unless, of course, you happen to be in Scotland, where Wildabeast Innard Pie is considered a delicacy. To make a long story short, I bet Paul he couldn’t go 48 hours as a pseudo-caveman. I reminded him that beer is an agricultural bi-product, and hence was unavailable to hunter-gatherers. Hello, dear niece! great to be with you in Portland. So, Paul is continuing with his cave man diet, eh? crazy guy...but you knew that when you married him. You are indeed a good writer..this is the first time I've had the pleasure of reading something you've written. Keep up the good work!